Cape Town, South Africa, November 2012 Never mind the World Cup, the FA Cup, and the Euro Cup for some homegrown, fast-paced soccer action, what you need is the Heart Cup! Heart 104.9FM is celebrating local soccer, on the 1st and 2nd December, at the Mitchells Plain Festival. 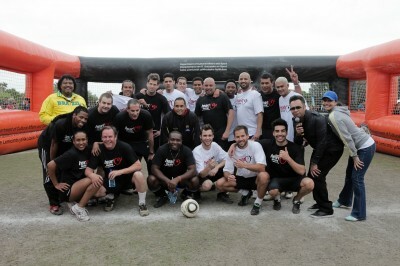 Heart 104.9FM is having their first annual Heart Cup a 5-a-side action football tournament, where you get to be the MVP! Games are 5-a-side action soccer, and played in ten minute matches Matches are on Saturday 1st and Sunday 2nd December, at the Mitchells Plain Festival at Westridge Gardens. Dont forget to invite your family and friends to support, and to watch the Heart 104.9FM jocks face off against local celebs like Chad Saaiman, Sekoati Tsubane, Lloyd Jansen and Martin Prazak in a 5-a-side Celebrity Match on Sunday, 2 December, around 12h00! The Heart Cup is brought to you by Heart 104.9 and the Mitchells Plain Festival One Festival, Many Opportunities. Keep your dial locked onto Heart 104.9FM 24 hours a day, Monday to Sunday, or visit www.1049.fm. Ends / 153 words Media release issued by DTM SA on behalf of Heart 104.9FM. For press assistance contact Marieza van Zyl on +27 21 419 2699 or e-mail marieza@dtmsa.co.za. For further information on DTM SA visit www.dtmsa.co.za, contact Karen du Toit on +27 21 419 2699 / 94 or e-mail karen@dtmsa.co.za. More Info: Author: Simone Jansen from DTMSA. Originally distributed by MyPR.co.za. No of Images Uploaded: One To gain access to One image/s please Like, Tweet or +1 this article: [l2g] Images: [/l2g] . . .
JOHANNESBURG, South Africa, 7 November 2012 Eastgate shopping centre’s signature annual Look of Fashion event, which takes place on 16th November this year, will feature LOCNVILLE, SA’s much-loved duo who in the last few years have not only achieved #1 Platinum Status success for their debut album ‘Sun in my pocket’, but also won the SAMA Award for Best Newcomer and Biggest Selling Album, MK Award for ‘Best Newcomer’ as well as winning the Heat Magazine ‘Hot 100’. Their second studio album ‘Running To Midnight’ was uniquely released with a 100 day countdown, involving 294000 plus fans in the process from start to finish. It includes the radio hit ‘Stars Above You’. The Eastgate Look of Fashion 2012 final event, featuring all twelve selected finalists, will take place at Eastgate shopping centre. This year’s show is choreographed and produced by fashion extraordinaire Juanita Daniel and will feature further performances by sensational new performers Benedikt Sebastian and ChianoSky, who have both launched their debut albums countrywide this year respectively titled ‘Jy Weet Ek Weet’ (produced by industry stalwart Gabi Le Roux) and ‘Hungry’. The event will be hosted by Pabi Moloi, well-known radio DJ at Highveld 94.7 and previous host on All Access. The Eastgate Look of Fashion competition received hundreds of entries for participation this year. Entrants 18 years of age and not older than 25 after 1 November this year could enter. Thirty semi-finalists were selected to attend a screening at which twelve finalists were selected. Two previous winners, namely Tansey Coetzee and Bokang Montjane, went on to be crowned Miss South Africa after winning the Look of Fashion title. Celebrities that have entered in previous years include Claudia Henkel, Shashi Naidoo , Rosette Mogomotsi and previous runner-up, Celeste Khumalo, who was crowned Miss SA Teen in last year’s competition. For more information visit www.eastgateshops.com or contact the Customer Service . . .